Main Level Living . . . All the areas that you need to live each day are on the main level with no stairs. Optional private guest suites or secondary entertaining areas can be added to the upper or lower level or both! Low Maintenance. . . The exterior materials need minimum maintenance. Irrigation is included with each home. In most instances there is lawn/yard and winter maintenance available as a service of the neighborhood association allowing you time for the vacation home or for other plans. Open Floor Plans . . . Each plan is designed to maximize the available space for entertaining friends and family including the architectural detail of a fabulous fireplace, grand granite counter tops, open dining room using arches or columns with beautiful detail. All of this illuminated with banks of sunny windows and all framed with expertly crafted wood trim. Custom Design Service . . . A floor plan will be developed based upon your budget and the way you chose to use your home. Step by step with your input and direction we will go from conceptual sketches to floor plan design to full working drawings and the construction of your new home. Woodstock Custom Homes offers over 10 years of Empty Nester award winning home design experience. A strong feature is creating exceptional use of space to match the way you use your home including plenty of storage areas for everything! Bring Your Plans . . . We can work with plans you have worked on previously or plans you have found in a magazine or on the internet. Sometimes we take the best of a few plans and morph them into a new one. We can make suggestions and improve the plans you have. It is an exciting process to create your own distinct home. Design Details . . . That’s what makes a Woodstock Custom Home unique. Inside features may include high coffered ceilings, custom built in shelves and cabinets, beautiful custom crafted fireplace mantles, chair rail and picture framing in the foyer and dining rooms. Tray ceilings framed with elegant crown moulding in the dining room and master bedroom. Open spaces defined by arches, columns, cased openings, and special ceiling detail. Enjoy lots of light with special window designs expertly framed with beautiful woodwork. Art niches and special lighting may be included in strategic locations as desired. Finish materials include hardwood floors, ceramic tile floors- back splash- showers, granite counter tops, slate fireplace surround, or anything you can find in a magazine. Included . . . At Woodstock Custom Homes you will have many items included in the pricing without an additional charge. For example you will enjoy a 90% efficient gas furnace, solid core interior doors, Anderson windows, composite cement siding, lawn irrigation, dove tail cabinet drawers, soft close cabinet drawers, crown moldings, hardwood floors, granite counter tops, ceramic tile master shower, tray ceilings and raised ceilings, to name a few. Indoor – Outdoor Living . . . A Woodstock Custom Home Design extends from the inside to the outside as part of your living and entertaining experience. Special areas for outdoor living that are functional, beautiful, and affordable. From covered verandas to private free form patios with fire features such as a fire place or fire pit. Consider a water feature say a fountain, pond, falls, or even an in ground spa! No Surprises . 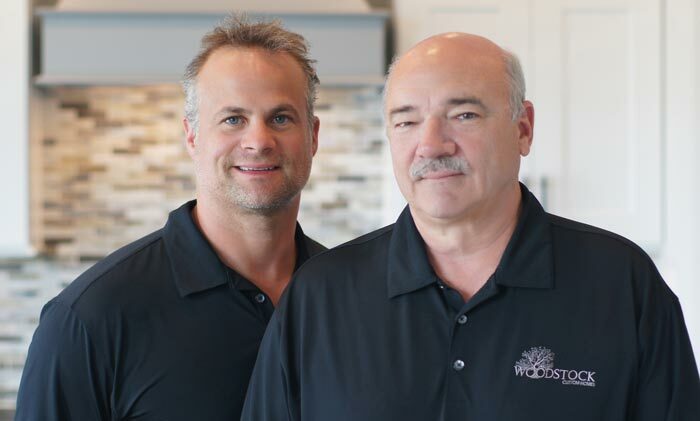 . . Woodstock Custom Homes will create a house based upon your input, your budget, a few of our suggestions, and deliver that to you on time and on budget. You will receive a written warranty at closing! You will be proud of your new home! One Stop Shopping . . . In addition to new home design and construction services Woodstock Custom Homes can offer financing options to match your needs, and coordinate the building of your new house with the sale of your existing home. In fact Woodstock Custom Homes will market and sell your existing house for you using over 25 years of Indiana Real Estate marketing experience. Of course, this is not an exhaustive list. We are constantly looking for great new ideas and, most of all, listening to you and how you’d like to live. That’s exactly why we call it “custom” homes, after all.